By Kim & Terry Kovel, ©2011, full-color report, 64 pages. 8-1/2 by 5-1/2 in. Find the unrecognized treasures hidden in the garage or attic! This report contains all the information you need to identify the hard-to-decode marks on modern ceramics (pottery & porcelain). It covers pieces by art and studio potters, factory-made everyday pottery, designers and importers from many countries with photos, history and marks. Each pottery is listed with a description of its work, years of productions, dates, color pictures of the pottery and the manufacturers marks. 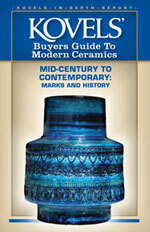 Filled with information not easily found that helps identify the most sought after collectible pottery. Everything from Arabia of Finland to West German pottery is included. Sixty-five companies are described with a paragraph, color photo and mark. Another one hundred twenty-five marks are illustrated and dated.This special report contains the information you need to be a savvy pottery collector laid out in the easy-to-use Kovel format.